AMS is caused by exerting yourself at high altitudes, especially if you have not been properly acclimatized. It is most common at altitudes above 2400 meters. 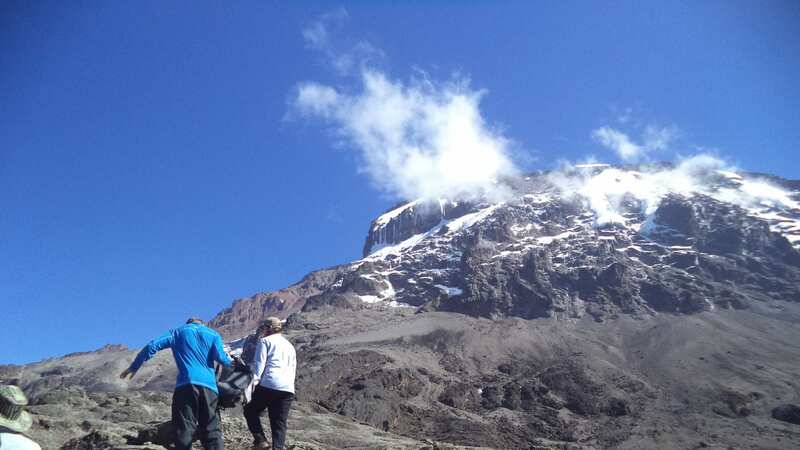 Kilimanjaro’s peak is nearly 6000 meters above sea level. At this height, the air pressure (and the amount of oxygen it contains) is less than half that at sea level, and has been said to be comparable to ‘working with only one lung’. Not everyone suffers from AMS, of course, and it is very difficult to predict who is or is not vulnerable to it. Generally speaking, a fit person is less vulnerable than an unfit person, because their cardiovascular system can operate at low pressures longer without as much strain. Even so, anyone can be vulnerable at altitudes above 3500 meters, no matter their fitness level, if they have not spent some time getting used to the low atmospheric pressures first. It is best to gradually climb higher each day, then descend lower to sleep. This lets you gradually become accustomed to lower pressures, and then recover somewhat overnight. You need to keep your respiration rate low enough to maintain a normal conversation. If you are panting or breathing hard, you must slow down. Overworking your heart and lungs substantially increases your chance of becoming ill. Drink much more water than you think you need. Proper hydration helps acclimatization dramatically. You need to drink at least three liters to four liters each day. As dehydration presents many of the same symptoms as altitude sickness, your chances of being allowed to continue are best if you stay hydrated. The general consensus of the research is that Diamox is helpful in avoiding AMS. We use it when climbing Kilimanjaro. We recommend you google Diamox and its effects yourself. It is a prescription drug, and you should consult with your doctor before taking it. Our guides are trained to recognize AMS and apply the appropriate first aid. They will monitor your blood oxygen saturation and evaluate your overall acclimatization, but it is vital that you monitor and report your condition accurately, for everyone’s safety.